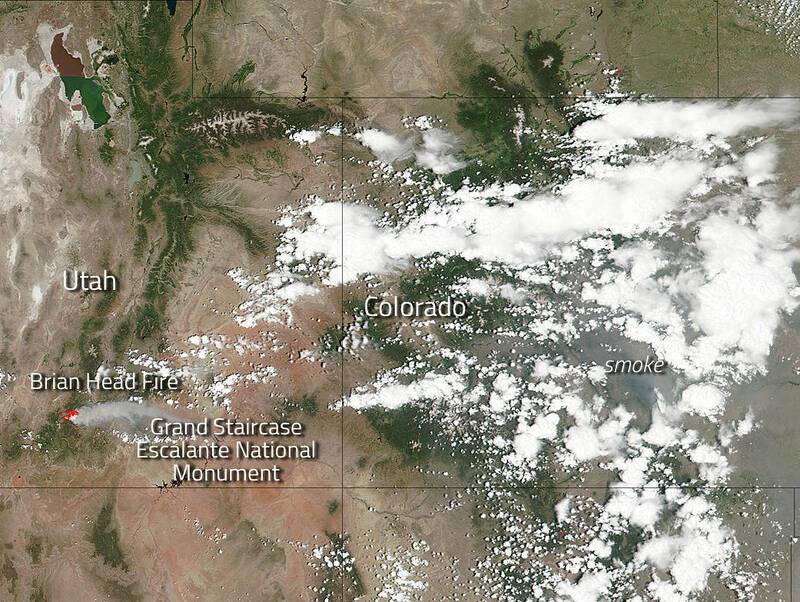 ST. GEORGE — An image released by NASA shows smoke from the Brian Head fire drifting hundreds of miles from Utah as dry weather conditions and abnormally high temperatures remain in the area. In the image taken by the satellite’s visible infrared imaging radiometer suite instrument, the actively burning areas detected are outlined in red. The human-caused fire started on June 17 and has since charred through over 40,000 acres. The smoke released by any type of fire is a mixture of particles and chemicals produced by incomplete burning of carbon-containing materials, whether its from brush, crop, structure or forest fires. The carbon monoxide, carbon dioxide, particles and soot are hazardous to breathe and can be particularly devastating to those with respiratory issues, NASA advised.